Israel is escalating its use of extrajudicial execution, warns the Euro-Mediterranean Human Rights Monitor. Israeli forces are deploying firearms against civilians who pose no threat and could be detained instead. Video recordings from surveillance cameras in the central train station of the city of Afula documented Israel's reckless disregard for lives as its soldiers shot a Palestinian woman holding an Israeli ID, claiming she attempted to stab a guard working in the station. However, the recordings clearly showed that the woman did not attempt to attack anybody. Eyewitnesses told a Euro-Med Monitor team that Israa' Abed, 29, was very scared and panicked when she found herself surrounded by Israeli soldiers pointing their weapons at her. The soldiers shouted at her to take off her headscarf and drop her bag. The woman refused to remove her hijab, but raised her hands and begged the officers not to shoot. "Even if the woman tried to attack someone, the Israeli police could have detained her instead of shooting with four live bullets," said Ihsan Adel, Euro-Med Monitor legal adviser. In another incident, an Israeli police officer shot Tha'er Abughazaleh from Jerusalem after he stabbed an Israeli soldier and three others, causing minor injuries. The police later declared the man was shot while being chased by Israeli soldiers. However, photos showed the man was shot directly in the head and the bullet later ended up near his head on the ground, which suggests he was killed deliberately. On October 4, the Israeli police shot dead Fadi Samir Mustafa Elwan, 19, from the village of Issawiya near Jerusalem, under the pretext that he stabbed a 15-year-old Jewish boy. Eyewitnesses told Euro-Med Monitor that a group of Israeli settlers chased Elwan when he was walking in the Masrara area in Jerusalem. At the same time, Israeli settlers gathered to protest the killing of two Israeli settlers earlier in the morning. Apparently, when the settlers saw Elwan, they attempted to attack him before he ran to Haim Barlev Street. An Israeli police car arrived at the scene, shooting seven live bullets toward the boy. Video recordings shared on Israeli websites showed Israeli settlers chasing Elwan and attacking him in the Almasserarh area before they beat him to death. Meanwhile, Hadil Alhashlamoun, 18, from Hebron, was killed at what is known as “Checkpoint 56,” where Palestinians are banned from passing unless they live in the area. 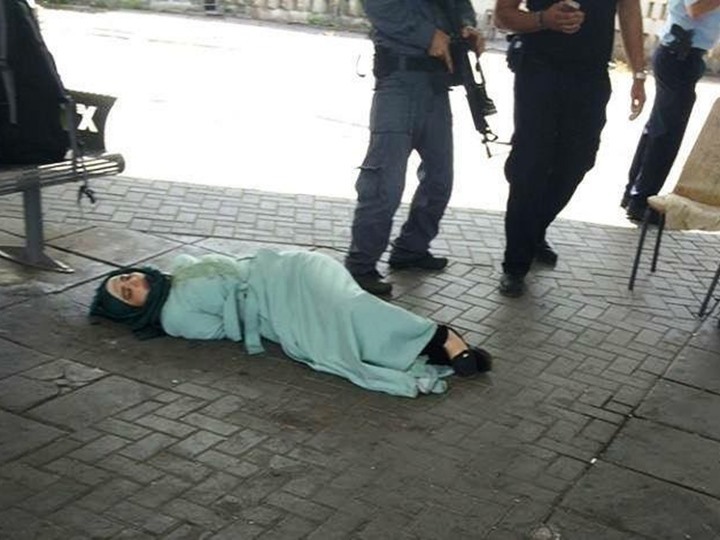 Israeli authorities claimed the teen was shot when the soldiers discovered she was carrying a weapon and asked her to stop and drop it while the girl continued walking before the soldiers fired live bullets towards the ground near her and she raised a knife. The soldiers immediately shot her in the chest and legs, according to Shaarey Tzedeq hospital where she was transferred. However, photos taken by an international volunteer who was present at the scene, as well as testimonies of eyewitnesses—including Fawwaz Abueisha, who lives in Tal Rmeidah near the checkpoint, showed the teen posed no threat to Israeli soldiers. The soldiers shot her in the left leg, and when she fell she dropped a knife she was hiding. While she could easily have been detained at that point, one of the soldiers shot several times more in the chest, legs and belly. Although an Israeli surveillance camera recorded the incidents, the authorities refused to share the video, which confirms the fact that the girl posed no threat before being killed. Such acts constitute a violation of the principles on the effective prevention and investigation of extra-legal, arbitrary and summary executions (ECOSOC Principles), which were endorsed by the General Assembly of the United Nations on December 15, 1989. The principles also state that firearms may not be used against persons except in the case of self-defense or the defense of others—and even then, only when an imminent threat of death or serious injury exists and intervention is needed to prevent the perpetration of a crime or prevent flight. In addition, the Code of Conduct for Law Enforcement Officials adopted by the UN General Assembly "emphasizes that the use of force by law enforcement officials should be exceptional; while it implies that law enforcement officials may be authorized to use force as is reasonably necessary under the circumstances for the prevention of crime or in effecting or assisting in the lawful arrest of offenders or suspected offenders, no force going beyond that may be used." Another incident in which Israeli forces violated these principles occurred on August 17, when Israeli border police killed Muhammed Bassam Amsha, 25, from Kafr Ra'i in the district of Jenin, as he was passing the Zaatara checkpoint. While Israeli police claimed that Amsha was carrying a knife and attempted to stab an Israeli soldier, eyewitnesses report they did not see the man with any knives. On the following day, Israeli forces stormed Amsha’s house, claiming hey had photos showing him carrying a knife before being shot. However, when his father asked to see the photos, the Israeli officer refused. Moreover, on July 23, Israeli forces killed Falah Hamdi Zamel Abumaria, 53, from the village of Beit Amr in Hebron. The soldiers stormed his house to detain his son, Muhammad; when they shot the younger man, Abumaria panicked and threw a pottery vase at the soldiers from his balcony. The soldiers responded by firing three live bullets at his chest. Israeli authorities claim the family refused to hand over their son and attacked the soldiers. However, according to Haidar Abumaria, Falah's other son, the soldiers beat and shot Muhammed with live bullets as soon as they arrived at the house, critically injuring him. Falah then started cursing the soldiers and demanding that they leave the house. He was shot in the chest and soldiers prevented ambulances from reaching him before he died. The Geneva Conventions and the Principles on the Effective Prevention and Investigation of Extra-legal, Arbitrary and Summary Executions state "there shall be a thorough, prompt and impartial investigation of all suspected cases of extra-legal, arbitrary and summary executions.” The Euro-Mediterranean Human Rights Monitor calls on Israeli authorities to open a credible and transparent investigation into these incidents, and to bring the perpetrators to justice. Ignoring such incidents gives a green light to other perpetrators and signals a complete disregard for human life. Moreover, the organization calls on the state parties to the Geneva Convention to take concrete steps to pressure Israel to comply with international law and respect the right to life.